would you benefit from working with a dietitian? You have been diagnosed with an eating disorder or think you have anorexia, bulimia, binge eating disorder, orthorexia, ARFID (avoidant restrictive food intake disorder), or rumination disorder. ... then you would benefit from the help of a nutrition professional. 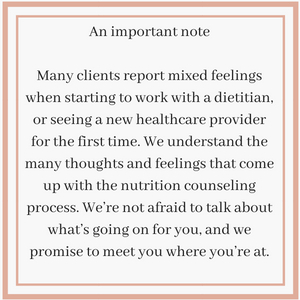 Individual nutrition counseling is for clients who need one-on-one support to reach their nutrition goals. Sessions are always personalized for your situation. When appropriate, we may have a separate “parent” session for anyone with a child in eating disorder treatment, and we may also have family sessions. We start with an initial nutrition assessment session, where one of our Eat With Knowledge dietitians will learn about you as a person and about your nutrition goals and expectations. We talk about everything related to nutrition, including your overall medical history (e.g., mental and physical health), favorite foods, typical meals and snacks, cooking abilities, grocery shopping, exercise habits, plus your thoughts and feelings about your current food choices and lifestyle habits. We provide counseling and tools for new ways of thinking about and changing behaviors in areas you want to work on. We also talk a lot about “dieting”, body image, “good vs bad” foods, weight concerns, and nutrition/health “expectations” in today’s world. A lot of the work we do will include getting to know you as a human being. Knowing about your personality is a crucial part of the nutrition counseling process. If requested, we'll provide you with educational handouts, resources, and other materials to help learn more about various topics. We typically see clients at least every other week when we are actively working together (we offer different appointment lengths/charges to be accommodating). We work with clients short-term and long-term. Many clients in recovery choose to see us for a while, but less frequently. We always suggest a session to end treatment (not a phone call or email to terminate), because we like to take an entire session to outline an effective relapse prevention plan. Jennifer is in the office Monday, Tuesday, and Wednesday. Registered Dietitian and Founder of Eat with Knowledge.